A part of the living room with an unusual ceiling lighting has been allocated for the activity area. It has given interesting possibilities for decorating. Initially, light color palette and Classic-style design was chosen. 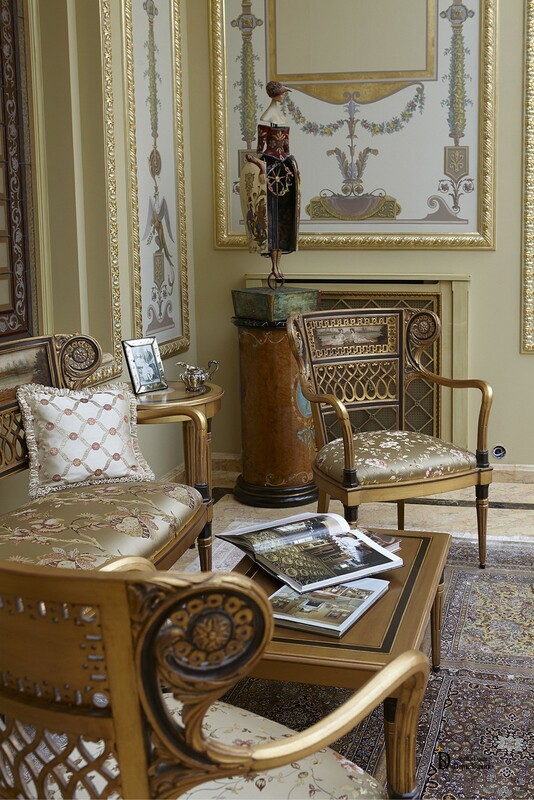 As a result, the ornate corner has become a wonderful place for enjoyable pastime, but at the same time is fully consistent with the overall concept of the living room. Panoramic windows and ceiling lighting have created an indescribable feeling of open space. It seems that you are not in a room, but on the open terrace. Plaster stucco moldings, items of the Interior, furniture and decoration are masterly selected. Color palette is quiet, there is no aggression and pomposity. This decoration has become a wonderful background for arrangement of the living space. Whatever time of day, pleasant lighting emphasizes the advantages of the décor of the activity area. At daytime, it is the ceiling lighting. Semi-transparent drapes provide soft natural light, and in the evenings, “palatial” chandeliers with lots of crystal pendants give “sunny” light and mood. Lightweight sofa and armchairs, chairs with exquisite carvings, elegant tables, unusually beautiful stands for mechanical toys. Carpet in subdued tones has combined costly and beautiful items that create aura of quietness. It visually softens the marble gleam of polished floors. The activity room does not have large items. Lightness and refinement have become the keynote of this project. The gilders have worked out excellently. Details have been drawn in very accurately, due to this there is no feeling of theatrical scenery. But there is elegance at the same time. It is difficult to imagine even super expensive wallpaper in the status Interior, and even more so, color painting of walls, which can be boring. Wall mural paintings in the style of late Renaissance have given the noble appearance and elegance. In addition, it has become framing for paintings that don’t look like alien elements, but are finely tied into the overall theme “wreath” of the Interior. Interior has become more harmonious. Color palette is very quiet. 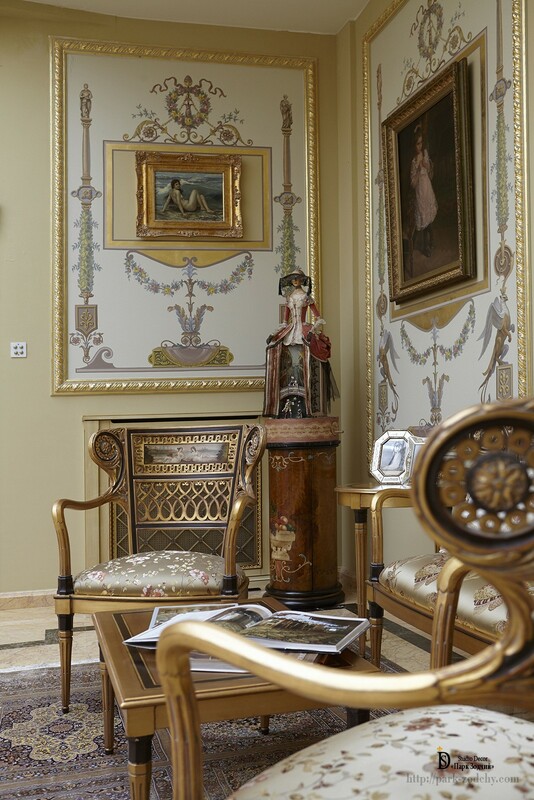 However, small bright touches: dark furniture elements, frieze on the floor, decorative pedestals, masterly chosen paintings have enriched the décor. These interiors are gathered bit by bit and unite talents of designers, mastery of cabinet designers and gilders, who use their knowledge, love of beauty, experience of architects of the past and expensive materials. 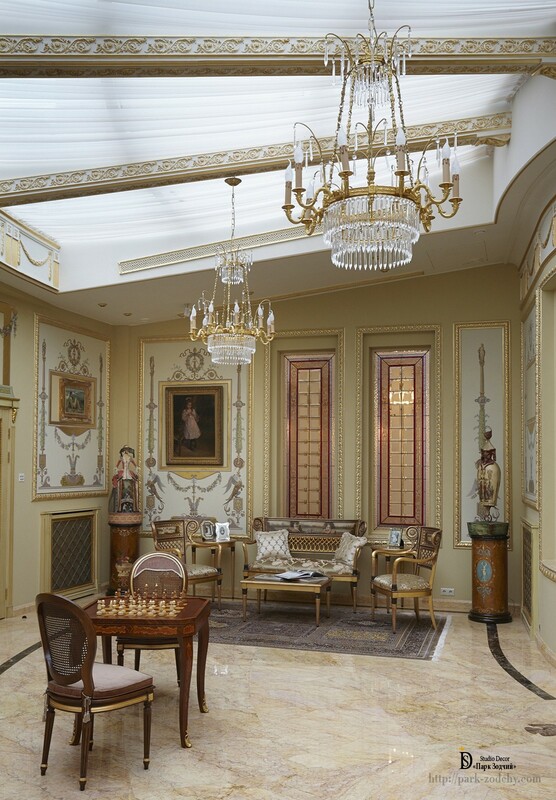 Due to this light and shade, architectural delights and interesting furniture, unusually beautiful floors and rare toys, paintings and chandeliers harmoniously complement each other and create the perfect life environment.